Last year there was great excitement at the Bog of Allen Nature Centre as a new species to the area was identified, the Red Squirrel (Iora Rua). Although the red squirrels do not hibernate they do become less active in Winter months. A normally shy solitary mammal, red squirrels come together through Spring and Winter to share warmth and help rear young. This mammal is still widespread in Ireland however with the introduction of the grey squirrel from North America the red squirrels distribution in Ireland has become patchy. Both squirrels compete for the same food and habitat and unfortunately the red squirrel has lost out to the bigger grey squirrel. 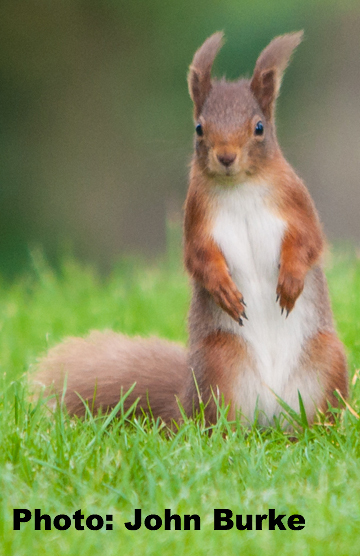 Red squirrels are easily recognised with their characteristic red fur, bushy tails and tufted ears. Their bushy tail along with the squirrel’s sharp claws aids with balance and jumping but also helps to keep them warm while resting. Their only habitat is woodland spending most of their time in the tree canopy feeding and building their round homes known as ‘dreys’ out of sticks, leaves and mosses. The red squirrel can have two litters of between 3-4 young per year. They can live for up to seven years however infant mortality is very high and dependent on food available to the young red squirrels in their first Autumn/Winter. Although the red squirrel will feed on bird eggs its main diet consists of seeds from trees including hazelnuts and stripping cones from conifers to gain access to the seeds within. The red squirrel will store food for use when food becomes scarce in ‘caches’ usually these are holes in trees. Although the red squirrel population has declined another Irish native mammal, the pine marten is offering hope. A study published in 2013 by University College Galway found red squirrel populations increasing in woodlands where the pine marten also lived as they found evidence that the pine marten was feeding on the grey squirrel. If you have a species you would like us to feature in ‘Wildlife Watch’ contact the Bog of Allen Nature Centre on bogs@ipcc.ie or 045-860133. This entry was posted in Wildlife Watch at the Bog of Allen Nature Centre and tagged Attraction, Bog of Allen Nature Centre, Conservation, Family Nature Activities, Nature Trail, Wildlife. Bookmark the permalink.